Brothers Tom and Harvey Dice built the “Dice Building” on the west side of Broadway in 1904. Originally from Missouri, the Dice brothers arrived in Eagle in about 1901. During the next 25 years they built commercial and residential structures. This was the second brick building to be built in Eagle. The north portion was built first. Then the south portion was built as soon as the first part was completed. The cost of the original Dice building was $1,505. The first occupant of the north side was a saloon and pool hall, the “Pony Resort,” operated by Wolcott resident Jack Hall. As soon as the south side was completed the “Silver Eagle Tonsorial Parlor,” a barbershop and bath operated by Grant Holton moved in. Miners and cowboys coming into town on a Saturday night paid 25 cents for a bath. A shave and a haircut literally cost six bits (75 cents). A drug store replaced the saloon. Ralph Wolverton was the druggist. He moved his stock and fixtures into the building in April of 1909. At that time the Eagle Valley Enterprise newspaper occupied the rear portion of the first level. drug store replaced the saloon. Ralph Wolverton was the druggist. He moved his stock and fixtures into the building in April of 1909. At that time the Eagle Valley Enterprise newspaper occupied the rear portion of the first level. 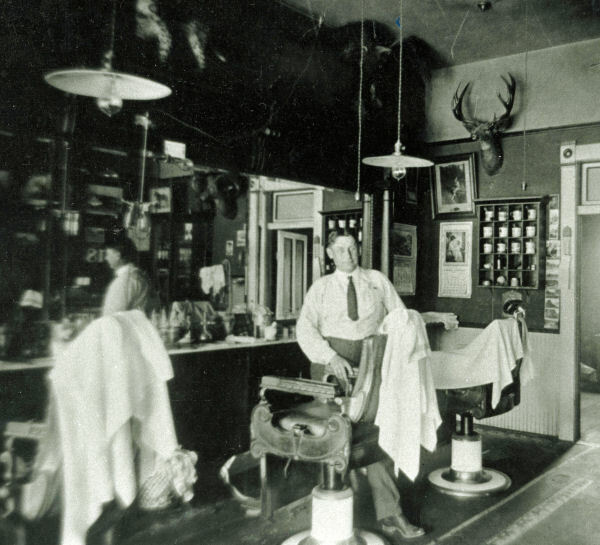 In 1910 Eagle resident Jack Bindley bought the Silver Eagle barbershop business, established in the south half of the building (lower floor). Jack’s son, Ira, followed him into the hair-cutting business. The barbershop operated until Ira’s retirement in the mid-1980s. For decades, the shop was the place where the men of the community stopped to trade information and gossip. The shop featured a red-and-white striped barber pole outside and a beautiful mirrored back-bar with shelves of hair tonic and shaving supplies inside. A taxidermy golden eagle perched on one wall and a glass-topped cigar case featured a display of three stuffed beaver cubs. The plastic silver eagle that was the shop’s logo is now on display at the Eagle County Historical Museum. 1910 Eagle resident Jack Bindley bought the Silver Eagle barbershop business, established in the south half of the building (lower floor). Jack’s son, Ira, followed him into the hair-cutting business. The barbershop operated until Ira’s retirement in the mid-1980s. For decades, the shop was the place where the men of the community stopped to trade information and gossip. The shop featured a red-and-white striped barber pole outside and a beautiful mirrored back-bar with shelves of hair tonic and shaving supplies inside. A taxidermy golden eagle perched on one wall and a glass-topped cigar case featured a display of three stuffed beaver cubs. The plastic silver eagle that was the shop’s logo is now on display at the Eagle County Historical Museum. The street-level space had several uses over the decades, including a post office and a drugstore with a soda fountain. The upper floors of the building were used for a variety of business and professional offices, as well as for residential quarters. Local lawyers Gene and Bill Luby and Hume White at varying times ran their law practices from the building. 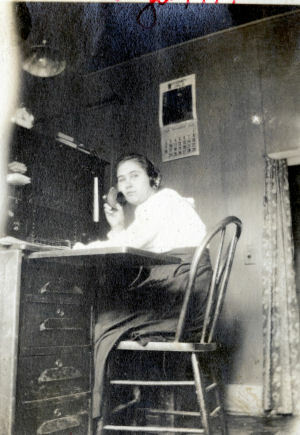 The United States Forest Service also had office space in the upstairs in the 1920’s. he street-level space had several uses over the decades, including a post office and a drugstore with a soda fountain. The upper floors of the building were used for a variety of business and professional offices, as well as for residential quarters. Local lawyers Gene and Bill Luby and Hume White at varying times ran their law practices from the building. The United States Forest Service also had office space in the upstairs in the 1920’s. For the past couple of decades the lower floor of the building has been used primarily as restaurant space. The upper floor is occupied by offices and apartments. or the past couple of decades the lower floor of the building has been used primarily as restaurant space. The upper floor is occupied by offices and apartments.